Disaster can strike at any time. From flooding from a burst pipe or ceiling leak to smoke damage from the flames of a fire, home and business property owners in Rancho Cucamonga always need to be prepared for the worst. It’s imperative to have the phone number of a professional disaster restoration team on hand in the event of a disaster. Thankfully, 911 Restoration of Rancho Cucamonga is able to provide local property owners with a fresh start and new beginning after flood, fire, or fungi hit. Our experienced and expert crew will arrive at your door within just 45 minutes from your initial phone call. 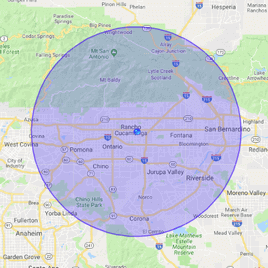 Whether you’re located in San Bernardino or Riverside County, we’ll be able to start disaster restoration services right away. We’re your neighborhood disaster restoration specialists that draw from nationwide expertise. Disaster is a very real threat to property owners in Rancho Cucamonga. Whether you own a home, apartment complex, or office building, a severe storm or fire can wreak havoc on your property. It’s critical to get to work right away in order to avoid costlier repairs and additional stress. 911 Restoration of Rancho Cucamonga will get to work right immediately to solve your disaster restoration dilemma. Regardless of how big or small the scope of the job is, our team is equipped with the proper tools and experience to promptly get your building, and your life, back to normal. We take a “fresh start” approach to every disaster restoration project we handle. 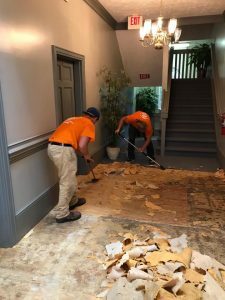 We understand that seeing your building in distress can be an emotional troubling time for you and cause a plethora of negative feelings, including stress, fear, and anger. This is why we’re here to lend sympathy and support in your time of need. It may seem impossible to see the silver lining of the situation, especially after your home or business experienced flooding or a fire. But that’s why 911 Restoration is here to help. After we’ve completed our disaster restoration services, we’ll help you start an entire new chapter in life. Whether it’s from basement flooding or a tropical storm, water damage inside your building can be severe. From unsightly stains to health problems associated with the growth of mold inside of your home, water damage needs to be addressed swiftly. 911 Restoration understands the importance of speedy services when it comes to water damage. Water damage only gets worse over time. The clock is ticking when it comes to saving your property and your possessions. Within just a few hours, carpets and dry wall can become soaked. And within just a few days, mold can start to grow. We are equipped to handle the problem right away. We provide 24/7/365 services and will be at your doorstep within just 45 minutes. Whether it is night or day, do not hesitate to call 911 Restoration of Rancho Cucamonga. Time is of the essence when water damage strikes. More importantly, it’s a job best left to the professionals. 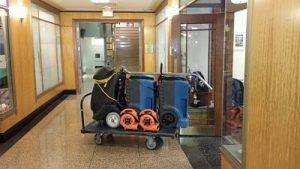 It’s next to impossible to thoroughly remove huge quantities of water from your building without the right equipment, and it can be dangerous. We have the proper tools to safely and securely carry out the water damage restoration job, and to totally dry and dehumidify your home in no time at all. When disaster strikes, it can be a nightmare to deal with. But we’re here to lend a helping hand in your time of need. We handle floods, fires, fungus infestations, and more. 911 Restoration of Rancho Cucamonga is the company to call when disaster hits. We’re available around the clock to get to work fast and to protect your investment from further harm. Contact us today!